Design teams from around the world unveil their visions today for a ring of ambitious projects circling San Francisco Bay, all aimed at increasing "resilience" to the challenges of rising sea levels and other growing threats to communities. After a year's worth of ground work, nine teams participating in the Resilient by Design Bay Area Challenge take the wraps off of their various visions. Some are long on lofty language and short on concrete plans, but all are the product of some of the world's most forward-thinking urban designers, funded mainly by the Rockefeller Foundation. "We've really been able to raise awareness around flood risk and come up with big ideas," says Amanda Brown-Stevens, the project's director. "And we believe that some of these ideas will be ready to take next steps -- that we can move toward implementation." Though none of the concepts will come cheap, some have fairly specific aims. The team known as Common Ground has a plan for relieving a major bottleneck at the north end of the bay. 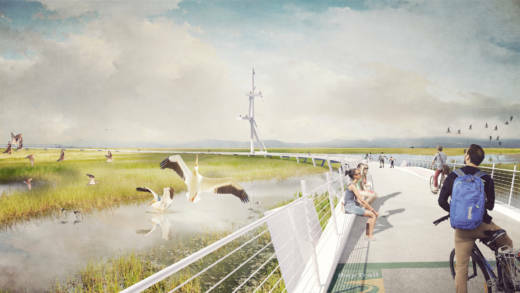 Designers envision raising State Highway 37 twenty feet off the ground to create a "Grand Bayway" that would both speed traffic between Sears Point and Vallejo and allow tidal flows to restore the marshlands underneath. Team members propose taking another year to establish "agreed goals and criteria" for their "far-ranging and ambitious" plan, while at the same time starting a series of smaller "bottom up" projects that would ultimately weave into the overall project. Highway 37, much of which is one lane in each direction, has become a major headache for North Bay commuters even when it's not closed by traffic mishaps or flooding, as it was several times in the wet winter of 2016-17. 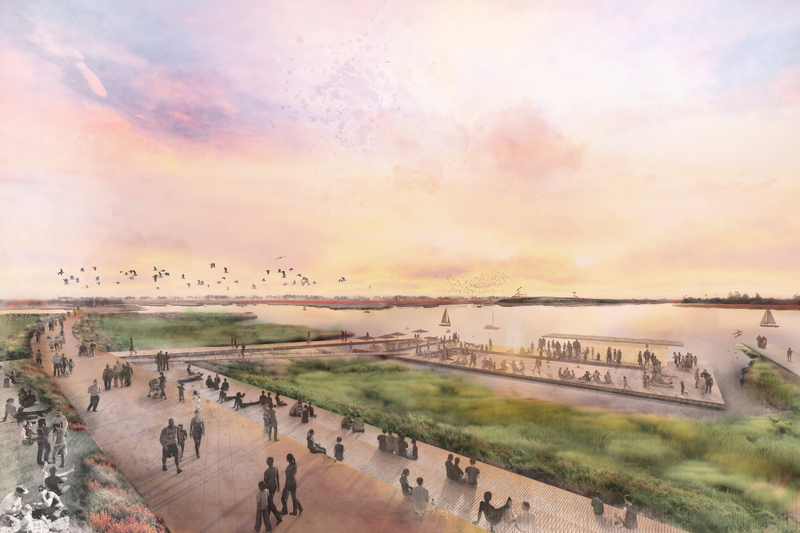 Meanwhile the All Bay Collective team says it is "rethinking the shoreline" around San Leandro with "a network of flourishing greenways" that would provide recreation and ecological benefits, as well as a buffer against rising bay waters. The plan counts on pulling together eight different communities from East Oakland to San Leandro to create and manage the resulting "Estuary Commons," which would include floating housing. Some of it is pretty "out there" compared to conventional notions of urban development. But designers say that's what's called for with projections for sea level rise ratcheting up, seemingly with each new study. "I think that what people are missing is that conventional development is going to fail," says Kristina Hill, an urban ecologist at UC Berkeley and member of the All Bay Collective. "It's not that we're doing this to be green. We're doing this just to make it over the next 50 to 100 years. This is baseline." The number of separate cities (more than 100) and counties surrounding the bay has always been an obstacle to this kind of cooperative planning. Add in port authorities, Caltrans, regional park districts, fish & wildlife agencies, BART, and so on, and the ensuing three-dimensional chess game can quickly become mind-boggling. "If you think about what flood risk looks like, it doesn't stop at jurisdictional boundaries," says Brown-Stevens, who holds up the RBD effort as a pilot for cooperative planning. "We really do need to collaborate." Not all of the collaboration panned out. One of the ten teams essentially dropped out of the race, possibly after meeting with resistance from stakeholders in Vallejo, where the team had envisioned a sweeping plan to address -- not only rising seas -- but transportation and housing woes, as well. The Los Angeles-based Team UPLIFT reportedly turned over its work to local officials, who will either run with the ball or not. Though the formal "challenge" winds down this week, the hardest tasks may lie ahead: getting some of these projects funded and accomplished. "We really do see this as a beginning," says Brown-Stevens. "Really, the success of this challenge will be measured by what on-the-ground impact there's been in the next year, the next five years, the next ten, twenty years." KQED Science reporter Molly Peterson contributed to this story.